These days, collaboration is supposed to be the panacea for everything from underperforming teams to bad management. Good ideas are supposed to cross-pollinate like magic across modern open offices. But in reality, collaboration doesn’t always work. Sometimes it’s noisy and unproductive, and someone needs to make a decision. How can business leaders maintain healthy collaboration and cooperation among team members? When should you implement hierarchical leadership? How do you do this while still ensuring everyone feels valued? Before you can bring the right mix of collaboration and decision-making to your workplace, analyze how much and what types of collaboration are appropriate. It’s important to recognize the realities, and limits, of your corporate culture and industry. Some workplaces are naturally more collaborative than others. For instance, ad agencies and real estate firms rely on full-blown teamwork to launch a successful creative campaign or to sell a house. As shown on Mad Men, if even the lowliest intern brings a good idea to the table, the firm runs with it. In these types of cultures, everyone is expected to contribute ideas. In turn, everyone expects to be heard and recognized for their work. It’s a reality that not all corporate cultures can operate at the edges of full collaboration. Some organizations operate better with something more akin to the old command-and-control style, or a happy medium between the two styles. Think surgeons or certain types of engineering. Yes, people in these jobs may perform better when they listen to their team and ask for advice. But ultimately, the surgeon needs to make the call of when, where and how to operate. Even in environments where collaboration works well, there are legitimate situations where one person needs to make the final decision. Once you’ve identified the amount of collaboration that is appropriate for your organization, clearly communicate what is going to happen. Set expectations, and establish goals and objectives. For example, if you ask for ideas on how to improve your company’s safety record, be clear about next steps. Will all ideas be presented, considered and voted on by a group? Or, will one manager take in all suggestions and make the decision? By setting expectations up front, you prevent frustration and misunderstandings about how much team members will be able to participate and collaborate in the decision-making process. In the case of group projects, it helps to define roles, responsibilities and the decision-making hierarchy up front. This keeps all team members accountable to agreed-upon deadlines and deliverables, but also clearly delineates how collaboration will fit into the team’s end product. It’s also important to understand that some projects may work better using a collaborative model than others. As you try to bring a more inclusive, collaborative style to your workplace, you’ll also have to build your team’s conflict management skills. For the conflict-averse, this can be an uncomfortable concept, particularly if they associate “conflict” with unpleasantness. It may help persuade reluctant participants if you reframe conflict resolution as discussion, constructive suggestions, consensus-building and listening. If only a few people are offering ideas and discussing the pros and cons in a meeting, invite the quiet team members to voice their ideas and concerns. Be clear that you want to hear diverse perspectives, and insist that everyone respect differences of opinion. If emotions run high during discussions, refocus your group on the data and goals at hand. Collaboration isn’t the salve to heal all business wounds. Poorly planned or ill-structured collaboration can impede productivity and be highly frustrating, especially to your best workers. High performers may also become dissatisfied if they feel the right decisions aren’t being made in a timely manner, or that collaboration is simply a buzzword that results in them doing all the work. That’s why it’s important to analyze how much collaboration is appropriate for a given company, department or project – and make certain that everyone is pulling their weight. If some team members aren’t meeting expectations (see strategy #2), be prepared to assess the situation and make changes or redistribute work as needed. In a call center, for example, high levels of cooperation and collaboration are required among staff to ensure that customer queries are resolved in a timely manner. But if a few high-performers consistently take care of the most calls or handle the most difficult customers while others take frequent breaks, you’re bound to lose good employees. That’s when decisions must be made on how to spread work more fairly. Remember, effective collaboration requires planning. Planning allows your group to establish and follow guidelines and data to get the desired outcomes. Collaboration without a plan will frustrate detail- and deadline-oriented employees, often making them feel like they’re wasting time or doing more than their fair share of the work. At the end of the day, collaboration isn’t about making people feel good about their work, though hopefully that’s a happy byproduct. It’s about making your business as successful as possible. It’s about the bottom line – and friendly, respectful collaboration done right can make a business stronger. 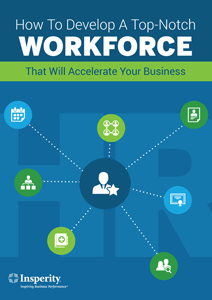 Learn how to optimize your workforce by honing your management skills. Download our free e-book, How to Develop a Top-notch Workforce That Will Accelerate Your Business.